If you’ve never been involved in the planning of a wedding before, there is a chance that you’re not all that sure about exactly what such a day should involve. If this is the case for you, you may feel a little overwhelmed about what you need to do – but the good news is that we have the expertise to work with you as someone to bounce ideas off of, giving you all the help that you need along the way in order to make your dream a reality. To ensure you get the attention you deserve, the first thing that we need to do is to arrange to sit down with you and talk about your overall vision for your day. Once we have an idea of that, we can make sure that we’re on the same page, and start to make some plans in a little more detail. It is important to do this because your wedding should be uniquely you, and everyone will have different ideas and theories about what a perfect wedding day might be. Looking for the ultimate in personalisation, professionalism and fun, guaranteed to transform your lovely day into one you never even dreamed possible.The All Day Wedding DJ Service is the perfect choice for you: You come to me because I am an expert in my trade, our all day service will ensure you get just that. It is about giving your special day the WOW factor. It’s about putting smiles on faces, bringing people together, and giving you and your guests a day they will never forget. This services creation has been extensive including travelling the world many times to work with the very best DJs in the world, bringing that knowledge back to UK shores to create the entertainment experience that’s perfect for you. 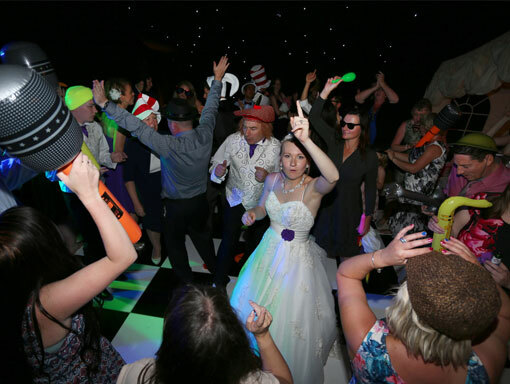 With 30 plus years of experience specialising in weddings, having trained with some of the best wedding DJs in the world, you can rest assured that the dance floor will be full throughout the evening, that all the music you love will be played, and your guests will leave with some incredible memories of a fantastic night. When you book our evening wedding DJ service, you and your friends can choose all of your favourite must-play songs. As well as highlighting the ones you love, you can also tell us the ones you hate, and we promise not to play them even if your best friend’s auntie gets on her knees and begs! The Love Story is a way to emotionally involve all of the guests at your evening reception. It is generally read just before your first dance and has frequently been one of the biggest highlights for our couples on their wedding day. Your guests will cheer they will ooh and aaaahhhh, there will be laughter and maybe even an emotional tear. As I tell the story of how you met and fell in love from your first date, to that moment when you looked at partner and realised they were the one that you were destined to spend the rest of your life with. Through to how the perfect proposal was planned & delivered culminating in your love message to each other. Your love story is unique but every couple has one and when I tell yours, couples at your reception will be transported back to when they first met maybe evening the day they got engaged! So when you step out onto the dance floor for your first dance as a married couple they are even more engaged in what’s happening. It’s the one thing that truly will make your wedding day unique and I believe no wedding should be complete without one. I care about your wedding day as much as you do and I am committed to its success. I am not happy with just a shake of the hand and thank you from my couples at the end of the night, for me, it’s more personal. If you’re not completely happy with the service I provide, You have my personal money back guarantee. My satisfaction record and reputation is very important to me. I have had 100% satisfaction to date and have never had to repay a penny.